Canadian officials on Friday ordered boats including cargo and cruise ships to reduce their speed in the Gulf of Saint Lawrence in a bid to protect endangered whales. The speed limit was capped at 10 knots (11.5 miles, 18.5 kilometers) per hour—about half the average current speeds—in areas where whales have been reported. 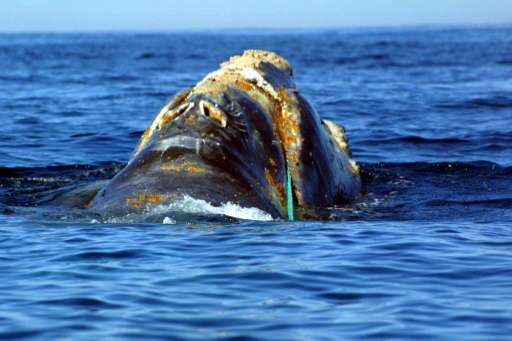 The move follows two months that saw an average of one North Atlantic right whale per week found dead in the shipping channel, which connects the Great Lakes to the Atlantic Ocean. A decomposed whale carcass was also recovered off the coast of the US state of Massachusetts this week, bringing the whale death toll in the northeastern coastal region that includes the US and Canada to twelve. Preliminary examinations of the carcasses found evidence that the endangered marine mammals died of blunt trauma, likely from collisions with vessels. Some showed signs of having been tangled up in fishing nets. A necropsy report will be released next month, said Fisheries Minister Dominic LeBlanc. Federal officials hope limiting boat speeds will allow whales time to get out of the way of vessels and, if they fail to, limit injuries. "We are taking the situation of endangered species very seriously," Transport Minister Marc Garneau told journalists. "We know that an unprecedented number of right whales are currently in Canadian waters and that makes them vulnerable to navigation. They may have been hit by ship," he said. "We are taking steps to reduce the risks of other deaths in that area. We want these whales to be able to coexist with ships." The North Atlantic right whale, which is much larger than a humpback or a gray whale, is one of the most endangered whale species. Only about 500 of them left in the world's oceans. There are an estimated 80-100 whales in Canadian waters now. The temporary speed limit will remain in effect in the western part of the Gulf from Quebec's north shore to just north of Prince Edward Island, until the whales migrate out of the region, said official. Speeders will face fines of up to Can$25,000 (US$19,700). In July, authorities also banned fishing in several parts of the Gulf of Saint Lawrence to protect the whales.